Friday lay day – will the German refugees end up in Minijobs? Its my Friday lay day blog and I am catching up on things that I put to one side while I was away in Finland. But I have been doing some research on the impacts of the massive refugee flows into Northern Europe from the military conflicts in the Middle East. A more detailed analysis will appear later. The very difficult problem facing Europe, in particular, at present, and the World, in general is how to cope with the millions of people that are being displaced from their homelands by war, terrorism and/or environmental degradation. It is no easy task to deal with. The seemingly unending flow of refugees into Turkey and then greater Europe is challenging the archaic decision-making processes of the European Union. Once again it brings into relief the need for a ‘federal’ European government that can make binding decisions across the Member State space and provide fiscal backup to ensure those decisions are viable from a resource perspective. There was a Reuters report (October 15, 2015) – Refugee spending will drive our economy, Germany says – which noted that the refugee flows could underpin an economic boom in Germany, the first nation to announce it would settle large numbers of the asylum seekers. Here is part of the framework I am developing to consider this issue. The German government is banking on the refugees arriving in its cities by the thousands each day to help turbocharge its economy and offset the effects of weaker demand from China. The German government has certainly shown a strong humanitarian bias in its decision to accept huge numbers of people from the Middle East who have arrived on its doorstep in recent months. The German growth forecasts have been downgraded in recent months as a result of the slowdown in China. The Chinese fiscal expansion in 2009 saved that nation from the GFC and its on-going strong growth provided a safety valve for Germany (and the Eurozone in general) to divert exports to China. The Chinese slowdown is now bringing the domestic austerity in Germany into relief. It is clear that it cannot go on suppressing domestic demand and relying on strong net exports growth to drive its overall real GDP rate. An expansion of domestic demand in Germany, despite what the boss of the Bundesbank has said on a number of occasions, would also provide some assistance to beleagured economies such as Finland, which relies on German imports to help it grow. But what sort of impact will this refugee flow have in Germany? I will write further about this question – for Europe as a whole – in subsequent blogs but today I was reading a book I first purchased in 1979. The book was written by Michael Piore – Birds of Passage: Migrant Labor and Industrial Societies – and was published in 1979 by Cambridge University Press. It analysed immigration flows in terms of the dual or segmented labour market theory, which Piore had helped develop in the late 1960s and early 1970s. He considered the impact of migration to advanced urban industrial nations from less developed rural societies. His thesis was that in most economies there are jobs that the locals do not particularly want to do. These are secondary labour market jobs that pay poorly, are precarious and are typically boring, dangerous, dirty or in some other way, unattractive. Firms might struggle to attract local labour and in that regard, “migration seems to be an almost perfect solution … The migrants want the jobs; national workers do not. What makes such migration a perfect solution, however, is its temporary character, and migrations of this kind virtually never remain temporary”. Man hat Arbeitskräfte gerufen, und es kommen Menschen (translation: We asked for workers. We got people instead). Frisch was reflecting on the experience of guest workers in Switzerland in the development boom that followed World War 2. The employers were only interested in attaining labour and forgot that they were dealing with human aspiration. This is particularly the case in the current situation where the refugees are unlikely to return to their place of origin. The problem then becomes how the settled communities that evolve. Piore’s analysis, although in the context of pull-factors (employers seeking workers) rather than push-factors (refugees fleeing unviable situations), was prescient. Many migrants stay longer than originally intended, develop permanent attachments, have children, or bring their families. Once permanent communities develop, the mi-grants are no longer satisfied with the jobs for whicb they were originally recruited. They instead aspire to the same kinds of employment opportunities as nationals, but there is nothing in the process that assures that there will be enough of these other employment opportunities to go around. In fact, history suggests that second-generation migrant communities bave difficulty meeting tbeir aspirations, eitber because the jobs to which they aspire are limited or because the workers are not trained to move into them. This assessment reminded me of a report I read a few years ago which I dug up this morning from my archives. The Report – The Labour Market Integration of Immigrants in Germany – was written by Thomas Liebig and traced the fortunes of migrants in the German labour market. [Reference: Liebig, T. (2007) ‘The Labour Market Integration of Immigrants in Germany’, OECD Social, Employment and Migration Working Papers, No. 47, OECD Publishing, Paris]. Germany has a tradition since the 1950s of large-scale net immigration. Immigration into Germany was initially concentrated on “low-skilled foreign labour” and many “of these ‘guestw orker’ immigrants settled and were joined by their foreign spouses, which has given rise to a second generation of persons with an immigrant background”. Subsequently, (from late 1980s), “Germany received massive immigration flows of ethnic Germans from Eastern Europe”, partly due to reunification. 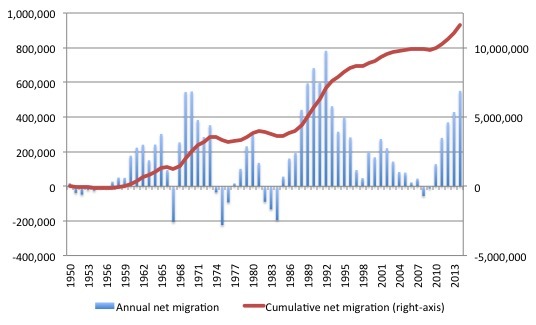 Data from the German federal statistics office (DeStatis) for Migration from the 1950s was used to produce this graph, which shows the annual flows of net migration and the cumulative effect of those flows. The Report found that, even though these workers had “low educational attainment … the the labour market integration of immigrant men is relatively favourable in international comparison. However, immigrant women, and particularly those of Turkish origin, have very low employment rates”. … very low educational outcomes. This hampers their access to vocational training, which appears to have an even stronger impact on their employment prospects than on those of natives. The low educational attainment of the second generation seems to be at least partly attributable to structural features in the German education system, such as the early streaming which puts migrants’ children in a lower track. Especially problematic is the relatively late starting age for kindergarten and the prevalence of half-day education in kindergarten and school, which limits exposure to the German language at a crucial age. Immigrants’ access to self- employment is hampered by legal obstacles and a lack of information and subsequent access to financial credits. This is consistent with Michael Piore’s conjecture in his 1979 book. Dual Labour Market theory – or Segmented Labour Market theory which was pioneered by Piore and others provides a reasonable description of the structure of labour markets in most countries. SLM theory argues that the labour market is segmented into two separate labour markets each with different processes for allocation and reward. These segments resist transitions from each other. The most basic demarcation is between the Primary Labour Market (PLM) and the Secondary Labour Market (SLM). PLM workers are typically employed in a tight internal labour market structure which provides for career advancement and tend to search for jobs within the firm while already employed. The jobs are secure and relatively well-paid. The SLM is characterised by low-paid, insecure ‘dead-end’ jobs which have high turnover rates. The jobs do not have well-defined career ladders and offer very little training for higher productivity. While the PLM worker searches for new ways in which to climb the career ladder, the SLM worker usually searches to avoid being sacked. Given the lack of mobility between the ‘segments’, a SLM worker will typically not make the transition into the PLM. Workers thus become ‘trapped’ in poor jobs with spells of unemployment intervening periods of low paid work. This is especially so in Germany after the Hartz changes (I no longer call them reforms) which created the so-called Minijobs. The Hartz process accelerated the casualisation of the labour market and the precariousness of work increased. Hartz II introduced new types of employment the ‘mini-job’ and the ‘midi-job’ and there was a sharp fall in regular employment after the introduction of the Hartz reforms. Mini-jobs provide marginal employment (no security or entitlements) and allow worker to earn up to 450€ per month without paying taxes, while the on-costs for employers are significantly lower. The no tax obligations also mean that the worker receives no social security protection or pension entitlements. The official line is that during the Eurozone years, Germany underwent a ‘jobwunder’, or jobs miracle. However the speedy increase in employment from the low of 2003 was driven by the mini-job boom. The neo-liberal apologists claim the minijobs satisfy the preferences of workers for flexible casual work. But the reality is different. They become just another rationing device when aggregate demand is too low and lead to rising inequality and diminished investment in human capital. A joint workshop on transitions from marginal employment in 2010, organised by the Institut Arbeit und Qualifikation (IAQ) at the Universität Duisburg-Essen and der Uni und dem Wirtschafts- und Sozialwissenschaftlichen Institut (WSI) at the Hans-Böckler-Stiftung (Hans-Böckler Foundation), found that while employers are increasingly splitting regular jobs into low-paid and insecure ‘mini-jobs’, there was no evidence of large-scale worker transition from ‘mini-jobs’ to other, more regular work. There were more than 7 million such jobs in June 2015. The question is how will these workers be absorbed into a labour market that has been fairly flat for a decade or so and where growth has been pronounced in this casualised segment of the labour force. These changes tend to suggest that the dynamics that delivered the results reported in the OECD Report discussed above in relation to first-generation migrants will no longer necessarily hold. They also suggest that the degree of alienation felt by the second-generation will increase. If all they have to look forward to is a minijob and that is not even an assured opportunity, then life will be harder than it was 20 years ago for the incoming migrants. But I applaud the German generosity in even offering these people a state to live in. There is some security in that after all. This is what I have been listening to this morning while I have been working. It is from Jamaican jazz/reggae pianist – Monty Alexander – playing Bob Marley’s song – The Heathen. The album is Harlem-Kingston Express (Live at Dizzy’s Club Coca-Cola, NYC) which was released in 2011. Here is a 2011 NPR article about the recording – Monty Alexander: Jazz-Flavored Reggae. One of my favourite albums in fact. But then I have a lot in that class. My band – Pressure Drop – is playing this Sunday afternoon at the Workers’ Club, which is on the corner of Gertrude and Brunswick Streets, Fitzroy in Melbourne. The support (Johnny Long Shot – a ska band) starts around 13:00 and Pressure Drop will play from 15:00 to 17:00. Should be a big afternoon at this great inner Melbourne venue. Entrance is $5. [Reference: Liebig, T. (2017) ‘The Labour Market Integration of Immigrants in Germany’, OECD Social, Employment and Migration Working Papers, No. 47, OECD Publishing, Paris]. “But I applaud the German generosity in even offering these people a state to live in”. There are a few aspects of this “generosity” which bear further examination. To the credit of Germany they have accepted their guilt in their contribution to WW2 and its horrendous results. That is more than can be said for Japan. Unfortunately this guilt complex is now being visited on many other nations of the EU,particularly Eastern Europe who themselves suffered under German occupation. Germany is insisting that other European nations accept their so called “fair” share of these illegal migrants.Germany,being the bully boy of Europe will no doubt get its way. Secondly,Germany may (or may not) have a problem with an aging population. The Growth Fairy might be on the loose there. Things are seldom as simple as they seem in the myopic view of the Loony Left and their cousins in the Bleeding Heart Club. The EU is setting itself up for a fall by accepting a massive influx of Moslem migrants who are diametrically opposed to to Western European culture and democratic tradition.These people won’t assimilate. Just ask the French. They have a self inflicted problem dating back further than Germany’s adventures. If I were German, I would consider Merkel’s decision to let in so many migrants as contrary to the interests of the majority. The only beneficiaries will be some employers, who suddenly see their reserve army of unskilled labor increase. People compete with their own kind. The masses of migrants are not going to compete with the residents of the Rotweingürtel (the tony neighborhoods), just as Mexican illegals do not compete with the editorial writers of the NYT or Harvard professors. As always, immigration is a class issue, and the classes favored by mass immigration are mainly the upper classes. But do the upper classes really benefit from immigration? They may benefit as employers, but they lose as taxpayers. In every European country, immigrants take more out of the treasury than they pay in taxes, at least over a lifetime. This is not surprising. If immigrants are employed in low-paying jobs, then they pay little in taxes but receive government benefits as much as others if not more. What matters is per capita income, but business thinks in terms of gross sales and profits. To a business, it is better to sell 8 widgets to 150 customers each than to sell 10 widgets to 100 customers each. Let’s suppose that in a village with 500 people there is one restaurant. On average, the villagers consume 12 meals per month. Now we add 200 immigrants to the village population. Per capita income goes down, and as a result the 700 villagers now consume 10 meals a month on average. Still, for the restaurant owner, the population increase was beneficial because he now sells 7000 meals per month instead of 6000. What people are willing to do or not to do depends on the wages offered. If I offer 5 dollars per hour to someone to rake the fall leaves in my garden, he may refuse to do it. If I offer him 15 dollars, he may accept the offer. The best way to insure that unappealing jobs remain unappealing is to bring in lots of immigrants to do them. These immigrants will insure that the wages for those unappealing jobs will not rise, which is of course the reason why employers want to bring in the immigrants. Let’s suppose that in Ruritania the labor force consists of 10 million individuals, of whom 3 million are in the low- skill sector. Those 3 million receive on average 12 ruris per hour. Now we bring in 2 million immigrants, of whom 1.5 million enter the low-skill sector. What is going to happen to the wages in that sector? They probably are going to fall on average. The labor force increased by 20%, but the low-skill sector increased by 50%, while the other sector increased by only 7.14%. If an employer can’t make a profit without immigrant labor, then he should just go out of business, just as we don’t let a company stay in business if it can make a profit only by dumping toxic waste in a river or having an unsafe working environment. Suppose that a business employs only immigrants. He may just as well invest abroad and employ foreign labor there. Very few people think hard about immigration because it is now a topic covered by political correctness. Immigrants are by definition foreigners and often non-white. By favoring immigration, the political correcties are engaging in virtue-signalling. They are simply demonstrating that they aren’t xenophobic or racist. As to the impact of immigration on low-paid workers, well that’s something for old-fashioned leftists, not for modern political correcties who think more about race and diversity than about class and equality. As to Syria, that war should end as soon as possible. Then the 4 million Syrian refugees in the neighboring countries can return home. The war would have ended already if the Americans, the Turks and the Saudis hadn’t aided the rebels as much. Ten cheers for Vladimir Putin for finally providing effective aid to Bashar al-Assad. Al-Assad may not be a saint, but he is far better than the primitive fanatics who want to install a nasty religious dictatorship. We have to chose the lesser of 2 evils. The Americans are being their usual hypocritical selves. They claim that they wish to further democracy in Syria, but their real aim is only to depose Bashar al-Assad. After all, he is an ally of Russia. How does he dare? They don’t. That is a pernicious myth that can be dealt with on the statistics, and not only that is utterly irrelevant. Whatever is deployed by Treasury comes back in taxes for any positive tax rate. Anything that doesn’t come back in any arbitrary time period is down to somebody in the spending chain choosing to save rather than spend. It’s never a matter of money. Funny, I recently met several newly arrived muslim immigrant contradicting that statement, since they all in action appeared keen to be part who western European culture and democratic tradition. “Things are seldom as simple” but then again they are when we ask “the French”. Do you have any actual evidence that those immigrants take more money out of the system than they put into it? Because if you don’t then it’s merely baseless speculation, and also the sort of rumormongering that the right wing anti-immigrant crowd constantly indulges in. Even if the accusation were true, that immigrants took more money out of the treasury etc – in today’s demand-constrained economies – this would be a very clear benefit to everyone else, the non-immigrants, especially the less well-off! So this argument presupposes the false and incoherent mainstream view of spending and contradicts the correct MMT view. One can see something like that in the real world. I don’t think that there is much dispute that in South Florida immigrants from Cuba have been notably adept in “taking more money out of the US Treasury”. This has led to lower unemployment rates and economic development there. One may not like the sort of, the style of development and economy there, but the region is not a basket case. As for the rest – it is neither favoring nor opposing immigration to suggest that human beings are not aptly compared to toxic waste. Nor to suggest that one should not discard everything one knows about economics in order to compose flawed and confused arguments towards apparently desired conclusions. Several Dutch studies have concluded that immigrants are net recipients of government revenue. One economist even called immigration into the Netherlands a second foreign-aid program. Such studies should be taken with a grain of salt because there are so many ways to measure a person’s tax consumption. How should we treat general government expenses such as road-building and law enforcement? Still, it is prima facie plausible that immigrants in Europe punch below their weight economically since a disproportionate number of them are in the 2 lowest socio-economic quintiles, where people consume more taxes than they pay. As a social-democrat, I’m all in favor of that, but as a national social-democrat, I think that solidarity should be practiced with one’s compatriots. There is no reason to believe that the situation in other European countries is different from the Dutch situation. Of course, opposition to immigration should not be confused with hostility to immigrants. Immigrants are simply the banal people who change their country because they think that it is in their best interest. If too many are let in, then the fault lies with the government. Just as a person can’t be faulted if he legally avoids paying taxes because of badly written tax laws, so immigrants can’t be criticized for taking advantage of lax immigration policies. A lot of people seem to forget that immigrants aren’t just producers but also consumers. They can only benefit the host population if their production exceeds their consumption. Consumption, of course, also includes consumption of government services. If immigrants increase GDP, as they most likely do since many of them are in the labor force, then that is not sufficient evidence for the position that they are economically beneficial. If they increase GDP by 50 billion but their total private and public consumption is 80 billion, then they do not bring economic benefits to the host population. Just as an opinion is not factually correct simply because it is politically correct, so an opinion isn’t false simply because it is held by people who are called the extreme right. Arguments should be judged by their intrinsic merits, not by their source. “Extreme right” is a misnomer because it isn’t an extreme version of the right. The right is the party that favors the haves, and the extreme right is the party that focuses on the nation and/or race. Every extreme rightwinger worthy of the name should only have disdain for the neoliberal, globalist, plutocratic right which wages top-down class warfare. Finally a quote from Wouter Bos, the former leader of the Dutch Labor Party: “Elke vorm van solidariteit kan alleen maar tot stand komen en in stand blijven door anderen daarvan uit te sluiten. Insluiting en uitsluiting horen by elkaar. Wie met iedereen solidair is, is uiteindelijk met niemand solidair”. My translation: “Every form of solidarity can only come about and be maintained by excluding others from it. Inclusion and exclusion belong together. Those who practice solidarity with everybody, end up practicing it with nobody”. 7 million mini jobs in Germany.The precariat as some have labelled them are growing. Perfect cheap and powerless workers for employers. That is 7 million plus Germans waiting to apply for those living wage job guarentees. “Those who practice solidarity with everybody, end up practicing it with nobody”. Who are “those”? Of course there are nobody in reality who practice solidarity with everybody, so the statement is just an biased construction of excuse to be used whenever one find a purpose for it. No wisdom there at all. Further, it’s impossible to know anything of the quality of those Dutch studies, their ability to predict the future based on method used etc. you’ve mentioned in this thread. So the counter argument is that there are several studies showing the opposite. The question then is, why do you not refer to any of those? How hard have you been thinking about those results as an person undefiled by “political correctness”? Or do they not fit your belief therefore disregarded? James Schipper: A lot of people seem to forget that immigrants aren’t just producers but also consumers. That is the opposite of the problem in the real world. That is like telling people dying of thirst in the desert to beware of drowning. What people – and it appears you and sometimes others here do – almost always forget is the opposite- that immigrants aren’t just consumers, but are also producers. Nations must “invest” for a long time without “return” to “produce” a worker out of a child. By comparison, immigrants, who are disproportionately workers, are much lower cost. I agree entirely on political correctness, whether opinions are held by the extreme right etc. I would not dispute the right of any person or nation to have an opinion or restriction on immigration. But all the “economic” anti-immigration arguments I have seen here are very bad on the merits, illogical and far-fetched, and I oppose bad arguments. Please see this for neutral analysis of effect of immigration on the UK economy. Nearly all good Latin American soccer players are now playing for rich European teams such as Real Madrid and Manchester United. This is called the leg drain. It illustrates how selective immigration works. It deprives poorer countries of their best and brightest. Suppose that 5% of Ruritanians have a university degree but that 50% of emigrants from Ruritania have one. Then emigration will lead to a reduction of average human capital in Ruritania. That is not going to help Ruritania become more prosperous. To go abroad to find “high-value” individuals is no more ethically defensible than to dump one’s criminals in foreign countries. In both cases there is a quality reduction of a foreign population. Every country should train its own labor force and deal with its own bad apples. Just as an individual who never practices altruism doesn’t deserve admiration, so a country that never practices altruism will not be respected on the global scene. However, I think that we should help foreigners in their own country, not take them in ours. If we bring in students from LDC’s, then we should make sure that they return to their country after graduation. What is the point of training foreigners as doctors if they will not practice medicine in their own country? Canada has 35 million inhabitants and Haiti has 10 million. If Canada were to adopt a policy of open borders for all Haitians, would that be a good idea? I don’t think so. I don’t think either that it would be a good idea if Canada took in 50,000 Haitians annually who are rigorously selected. The best policy for a rich country is to take no immigrants from poor countries. Lest some of you think that I’m a completely heartless xenophobe, let me just say that I make monthly donations of 150 dollars to 3 charities that operate in poorer countries. My annual income is between 30 and 40 thousand. The plutocratic Wall Street Journal favors a 5-word amendment to the American Constitution: “There shall be open borders”. Why does the WSJ favor such an amendment? Are they really very concerned about the well-being of ordinary Americans? I doubt that very much. I suspect that they advocate a large inflow of immigrants in order to put downward pressure on wages, to increase the price of real estate, to weaken organized labor and to undermine the welfare state. Unfortunately for them and fortunate for most Americans, most immigrants in the US and their children vote for the Democrats. This means that the more immigrants enter the US, the smaller the likelihood that the policies favored by the WSJ will be implemented. In the end, mass immigration may still benefit the American masses by putting the plutocratic Republicans out of business or else force them to abandon their plutocratic policies. It appears that you may not be looking at the real economy. A cheaper migrant worker may pay less tax than they “cost”, but their wage:productivity ratio is also lower than a national with the same job (at least in 457 visa cases or in the context of this article in Germany). This translates into the equivalent of the migrant worker being subsidized by the taxpayer, who then subsidizes their employer, who then either saves more, spends more, lowers their prices or hires more workers than otherwise if the demand is there. This essentially means that the taxpayer is subsidizing some combination of the migrant worker, the business they are working for, or that particular business’s customers. I believe that the vast array of opinions that could be held about this particular outcome probably all hold water in light of various philosophies. As a moderately unskilled worker myself, I have mixed feelings. And in medieval times, the church granted indulgences in return for alms to the poor. It was the spark for the Lutherian ‘heterodoxy’ against the Catholic church. You can’t absolve a moral dilemma with mere cash. That is primitive zero-sum thinking at its worse. If an immigrant comes in, is granted a basic income *and does nothing else other than consume* they will *cause* production activity that wouldn’t otherwise have happened – intensifying production and causing new investment. That’s the very basis of the ‘digging holes and filling them back in’ again concept, or the ‘bury bottles with money in them’ concept. Unless and until immigration causes inflation there is no production reason to restrict it. What low skill immigration actually does is cause a job match that wouldn’t otherwise have happened. That causes the production cycle to operate and it tends to generate slightly less than one new job that cannot be matched in return. The result is that some capitalist gets more profit, the country gets another person and an increase in the social structure to support them. But the existing residents, both unemployed and employed, get nothing – except perhaps an ironic suppressed smile when an individual of Pakistani decent make very, very racist remarks about a recent Roma immigrant. I didn’t engage in primitive zero-sum thinking. What matters is the size of the slices, not the size of the pie. Let’s say that Ruritania has 10 million people and a GDP of 300 billion. Now we add 2 million immigrants. GDP goes up to 342 billion, an increase of 14%. The pie got bigger. However, GDP per capita fell by 5% to 28,500. The average slice became smaller. It doesn’t necessarily follow that the 10 million non-immigrants became worse off economically. Quite possibly, their share of the new GDP is still 300 billion or higher, but we can’t only look at their market income. We should consider their market income minus taxes plus transfer payments and government services. If immigrants induce deficit spending, then it is possible that they make the non-immigrants better off even if their consumption exceeds their production. Granted, but the point is that a government doesn’t need immigrants in order to start deficit spending. Your argument is the same as the argument of those who argue that war is good for the economy. A government doesn’t need to wait until there is a war to implement macro-economic policies that bring about full employment. One thing that is often overlooked is that immigrants themselves create a need for jobs. If they increase the population, then there have to be more houses and therefore more construction workers. A larger population means a greater need for schools, hospitals, stores and so on, and that means more teachers, doctors, store clerks and so on. To some extent, immigrants perform jobs the demand for which they themselves created. Some immigrationist thinking is a reversion to mercantilism. As you know, mercantilists believed that a country can only prosper if it has a trade surplus, which meant that some countries had to be losers because, obviously, not every country can have a trade surplus. Many immigrationists believe that a country can only prosper if it has a net inflow of “high-value” international migrants. Obviously again, not every country can have such a net inflow, which means that some countries will be losers condemned to poverty. It is pernicious way of thinking. One thing that I have noticed among supporters of immigration is that they rarely look at international migration from the point of view of emigrant-producing countries. There are really 3 parties to international migration: the immigrants themselves, the immigrant-receiving country and the emigrant-exporting country. All three have to benefit. In the pharmacy where I buy my drugs there is woman with a pharmacy degree from the University of Zimbabwe and a man with a pharmacy degree from an Indian university. Did their countries become better off by their emigration? I wonder. It’s obviously a complex topic and Swedens growth has actually been quite good compared to say Denmark after the GFC but if you google “Sweden report” you’ll get one persons reasonable input into what he’s seeing on the ground there from the huge social upheaval in a small populated country. It seems quite fact based and quite scary. No you got one right wing persons whining. Ridicules blog. I live in Sweden and the “social upheaval” is connected to people not allowed to work for a decent pay check together with all other fake free market solutions introduced since the 1980s. Swedes as well as immigrants are curbed trough unemployment. That is the main problem and has been since the 1990s. It’s an escalating problem as long as you have politicians believing they can’t do anything other than wait for the fake free market to solve it, which it will not. Despite that and the population growth, both parameters who usually is said to increase crime rates, they have instead gone down through the last decades. So imagine if those unwillingly unemployed where given the opportunity to participate in society through decent work/conditions and through that meet one another, you would also get a much better integration. That is of course not enough. In Sweden you would need to also end the lousy voucher school system introduced in the 1990s, which is another reason for poor integration and falling result among all pupils/students swedes included. Generosity has nothing to do with it, as I’m sure you know! Gross GDP, but per capita it was overall flat during the rightwing gov. 2007 -2014. The European refugee crisis was expected since long, if those in power had bothered listen to competitive intelligence. It have been known for long that there is an rapid population growth in MENA and 40-50 % of the population is now below age of 20. With “ever” growing population of young men that have no real future, no jobs means difficult to settle with a family. Young men with no decent future will create violence. An ample recruiting ground for “rebels”. Just in Egypt the population is growing immensely every year what was the Roman empire’s bread basket is severely dependent on food import. In all of MENA arable land is a tiny part of the areal. Water is in many places scares. Add to this 35 years of neoliberal Washington consensus and European austerity economy. I believe it was already 15-20 years ago there was scholarly articles warning that it was ticking time bomb if there wasn’t sensible policies addressing this. Not least by the rich Europe. Instead we got senseless imperial warmongering policys making it bad to catastrophic.